This article outlines how to configure your Equipment Manufacturers within the CRM. Equipment records are often covered by a service contract however depending on how new the equipment item is, it could be covered by the manufacturer. This list allows you to manage the list of manufacturers available for equipment records. The screenshot below shows the location of the Manufacturer dropdown field when creating a new equipment item. To configure your Equipment Manufacturers you will require Prospect 365 Administrator rights, if you require these then please speak to your key CRM user or our Customer Services Team. To edit your Equipment Manufacturers, click on the settings icon in the bottom left-hand corner. Once within the Settings Centre, navigate to the Equipment & Contracts section & scroll down until you reach the Equipment Manufacturers configure option. By selecting the 'Click to Configure' link the Configure Equipment Manufacturers window will open. Within this window all of your current Manufacturers will be listed. To add a new one click on the + icon in the top right-hand corner. You can then start entering information about your new Equipment Manufacturer. The description should be the Manufacturers' name, ensuring this is relevant to all CRM users. 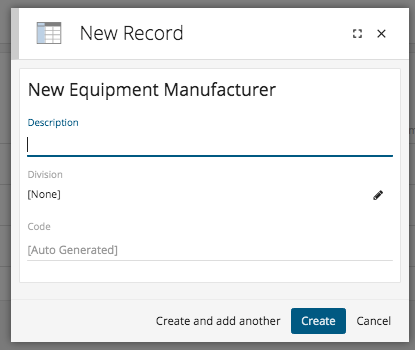 If the Manufacturer is setup as a division within your CRM, then you can click on the pencil icon to relate it's division record. Once happy with the information entered click Create.